We've been working on this for some time. Using our experience from Moredays and Hello projects, we're happy that we can announce the public availability of our new product - Customeed. We believe that even a CRM can have a great design and usability. Feel free to try it out and let me know if you have any questions or suggestions! Our time in business is extremely expensive and if you are not able to generate the new opportunities every day, to execute your projects and getting in touch with your customers, your competitors will do it sooner than you think for you. Customeed is built to bring only the most important functions, nothing more, nothing less. Creators believes that it's important to spend your time with your customers and not working hours with your CRM system. Customeed is a must have for all freelancers and small businesses that needs to do the business, not bureaucracy with the "corporate CRM systems". "We believe that in a small business, you need only a limited amount of information, because the majority of it is anyway transferred by phone or at meetings. We don't believe that forcing users to enter every piece of information to a CRM will bring you a new business." says Filip Molcan, co-founder of Customeed. With Customeed you can manage your opportunities, clients and projects like working with your e-mail. You can use it on your computer, tablet or smartphone - everywhere with pixel-perfect design and great user experience. "Our team gathered experiences from design, productivity and sales for more than 10 years to build the app that you will love using. We believe that simplicity, great design and outstanding user experience is what today users expects from business tools, not only from lifestyle apps." says Daniel Maslo, co-founder of Customeed. Finally there is a CRM that you really want to use. We’re living in the age of social networks. Nobody knows how long it is going to take, but at this moment, we spend hours checking all sort of social networks and making content for it. A few years ago, almost everyone had his/her own blog. Today, everyone is on social networks and generates content there. See the famous Social Media Revolution video if you don’t know the numbers. And that’s the reason why we’ve started Yournaline project. Yournaline is your up-to-date personal profile without moving a finger. We combine all your public content from your social networks and generate a beautiful website for you. We’re the new about.me, only better. We’re your blog, automatically generated. For start, we support all major social networks (Twitter, Facebook, Instagram, Foursquare and even fitness tools like Nike+ or Fitbit). We’ll create the journal of your life, automatically. Nobody has time for managing his blog, just use the content you generate every day and make your personal profile in a minute, updated in realtime. Sign in at yournaline.com to recieve your invitation soon! 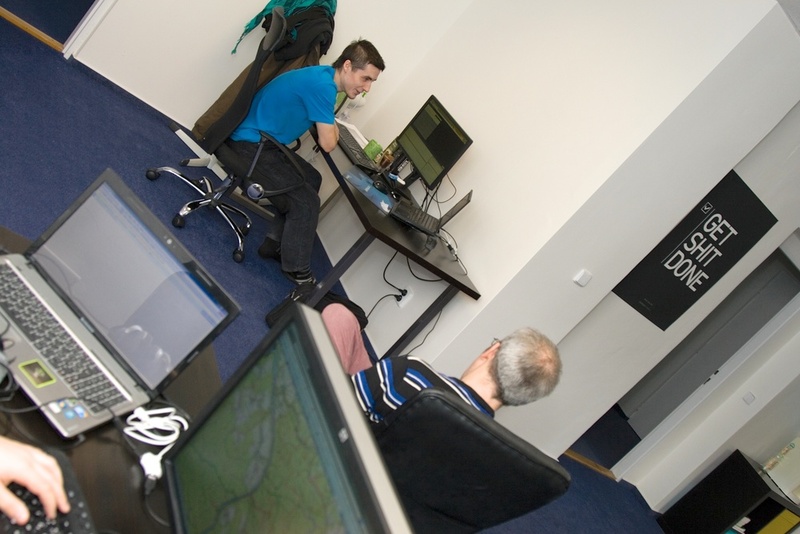 We moved to the new office at the end of 2013 with Czechgeeks and Pixerience. Now we have an amazing place to work on our great projects that you'll hear about this year! Busy times. What we’re working on? Last few months are very busy for us in Czechgeeks, Pixerience and blue.point. We’ve never had so many projects as we’re working on right now in our whole history. We strengthened our team with new people, we are now 36 people (all 3 companies together). All my companies are going to move to the new and much better offices very soon to support creativity and collaboration of our teams. In Czechgeeks, we’ve prepared a simple CRM system for us. But after a few weeks, we’ve decided to make this app available for everyone, because it’s so simple and nice that we think that you’ll love it! We’ll launch Customeed - The most easiest CRM in the world - soon. Feel free to register for an invite now. Also, we’re finishing quite a nice app for national parks all around the world with designers from Pixerience and also we’re working on a Moredays successor - Yournaline. All these projects are possible thanks to great developers in Czechgeeks and extraordinary designers from Pixerience. In blue.point, my first company that is working with handicapped people, we’re working on a “Trip advisor for disabled travellers” - Disway. With a great support from Vodafone, it’ll be the best service for all handicapped travelers! I’ll post more information about the projects in couple of days, so stay tuned! We'd love to share some updates with you about the future of Hello project. We are working on Hello since Autumn 2012 and we've invented some really neat features for it. We've launched sendhello.to on 1st of February 2013 and we got great feedback and interest from you. We had more than 30,000 signups in 3 days and we're really happy about it. We've been chosen to work with various accelerators early this year and we have a great feedback from some really large IT vendors. But we have decided differently. We have much more than only the features you can see on our website and we still believe that it's the right time for something big in e-mail industry. However, we've decided to discontinue Hello development. There is a lot of reasons why not do this - people are really excited about all new e-mail projects, we have great design and nice features (we'll reveal other features previews soon) that other competitors doesn't. But there is also a lot of reasons why not to continue on Hello. Working on such a large project takes time. And that's one of the main reasons - We think that we're too late in this industry. There is a lot of other projects working on new e-mail clients and I believe that we'll all benefit from this. So I'd love to thanks all of you for your interest and enthusiasm while sharing the great news about Hello. We're not leaving the e-mail industry, we'll continue to work on the future of e-mail and we'll share some interesting concepts what we've invented. But we'll not continue working on our iOS and Android client. Again - thank you for your support and sorry for bad news, we know that all of you would enjoy using Hello! Feel free to contact me if you have any questions or suggestions! P.S. Don't forget to check out other interesting projects like Mailbox, WeLoveMail or Evomail. Also, some great things will come from Apple, Yahoo and AOL ;-). It is probably the hardest startup to set up. You will spend the rest of your life obtaining new rounds of investments to assure growth. It is not a startup you can easily try out and close down in a year or two to try something new (yes, there are those who even manage that but here success does not necessarily mean victory and good experience). In this case, you are building a startup for life. Your reward will be moments that you can´t get from any other company in the world. So what is the best startup in the world that you can set up? Like any other startup, you first have to decide what kind of a startup you want. Where do you want to execute your joint business? What are the plans? To devote collectively to new developments? Or focus on other values? After defining the basic scheme, it is good to obtain a first investment. It will usually be someone from your surroundings – friends and family – and that who will help get you established. allow you to start off in the first place. An important step will then be obtaining another round of investments because it is usually just a matter of time until when you will want to expand your team. And that will require, among other things, money. In the beginning, you will only need to select your partner. You will then form your team together. The advantage is that you can shape the members of your team from the very beginning. But one disadvantage is that some traits and facts cannot be changed in any way. A new member of the team will bring you great pleasure and joy from the very beginning, despite being totally incapable. His quick progress will probably fulfill you more than the numbers on any financial report. Do not forget to constantly work on your team. Your new colleague has a great employment contract cannot be terminated! Don't forget, you will have this team for the rest of your life. From the marketing perspective, there are a number of significant waves – the initial enthusiasm, founding of a joint business, expansion of your team and then celebrating various milestones. In fact you do not need to worry about marketing whatsoever. It will all be taken care of by your friends and social networks. This startup markets itself and virally so (especially when it regards very good or very bad news). There are a great number of threats involved just like with a real business. What is most vital are relationships, maintaining a good mood and the startup spirit across the entire team. Everyone has to keep believing in your vision; if something stops working, the company is in danger of falling. Everything revolves around the team and especially the new arrivers. It is important, however, not to center the business around the new support but to focus on the development of the whole company. A great danger is falling short of financial resources that the company depends on to function properly. Although it can also function relatively well with limited income, low cash flow will limit your future development plans. With this startup, it should not all be about increasing profit. There are more important values in play here – fortune, health and love. Most successful CEOs will confirm that despite the importance of money there are situations where it could be traded in exchange for good health or love. It is important, however, to possess money because with its help, you can more easily conquer new goals. There is no financial report or a form that will tell you how you are doing. It is virtually impossible to change the team or your partner; such options can be very expensive and have an uncertain outcome. You do not need a marketing agency. Most of the PR will be done by your team. Do not underestimate human resources management. The departure of one member of the company very often means the end to the whole company. Control over the corporation is then gained by a new CEO and you will have to deal with him since you need to continue cooperating with this team of yours, even though you are one foot in another company already. Even here, good design is vital. And just like with product design, it is very individual. You do not need to bother if the design is liked by others, it is only you who needs to like it – this make is easier. As time goes by, the significance of design decreases, so it is not a key thing that you should build your entire success on – usually that will not work. There is no comparing the holiday times, trips and celebrations with your team with any other startup. Watching the progress of the youngest ones, seeing their first smile and first steps is something one cannot buy. And that is what it is all about. This startup won't make you money but will fill your life with something more important. It is not that difficult to come up with such a startup. In essence, most people have the same idea, vision and concept of implementation. It is about the right execution and luck – just like with any standard startup!